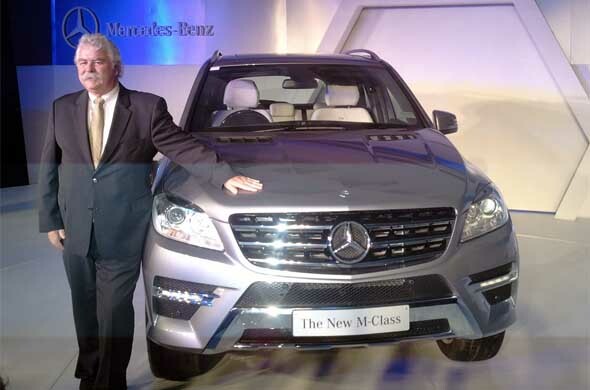 Mercedes-Benz India has launched the new 2012 M-Class SUV priced at Rs. 56.9 lakh for the ML350 CDI variant and Rs. 66 lakh for the limited AMG edition. The M-Class will be made available to customers from July 2012 onwards, while the limited edition, of which only 100 will be made, is on sale now. The new M-Class looks clean, sharper and more elegant than its predecessor. The new M-Class is 23 mm longer and 15 mm wider than the outgoing model. The interiors of the new M-Class have many changes such as redesigned AC vents, new central console layout and refreshed instrument cluster. The ML350 is powered by a 3-litre, six-cylinder, common-rail diesel motor that puts out 258 Bhp of power and 619 Nm of torque. The engine is mated to a 7-gtronic (7-speed) automatic transmission. The new ML 350 can accelerate from 0 – 100 Kmph in 7.4 seconds and reach a top speed of 224 Kmph. The new M-Class comes with a long list of standard equipment such as ECO start/stop function, reversing camera, active parking assist, airmatic suspension, tail lights featuring LED fiber-optic technology, attention assist feature, memory seats, thermotronic auto climate control, media interface, electric parking brake and electric sliding sunroof. The airmatic suspension has an auto leveling feature which keeps the vehicle at the same level no matter what load it is carrying. It also allows the driver to select various comfort settings of the suspension. The M-Class features an all-wheel drive system with selectable low-range gearbox as well for challenging off-road conditions. It can handle tarmac and testing off-road conditions with equal ease. The M-Class will face stiff competition from the segment leader, Audi Q7 and the BMW X5.